Thanks to a “scoop” in DTM Magazine’s latest issue, there have been lots of talk about a new Vocaloid called “Lily” for the past couple of days. According to DTM Magazine, a new Vocaloid, codenamed “Lily,” will be illustrated by KEI. Crypton confirmed via twitter that there is no connection between the new Vocaloid Lily and their company. The current theory is Lily is being released by AH-Software (AHS) as part of their Vocal Artist series, and the voice source is the lead vocalist of m.o.v.e. (“yuri,” which translates into Lily). It should be noted that although this is most likely, it has NOT been officially confirmed. 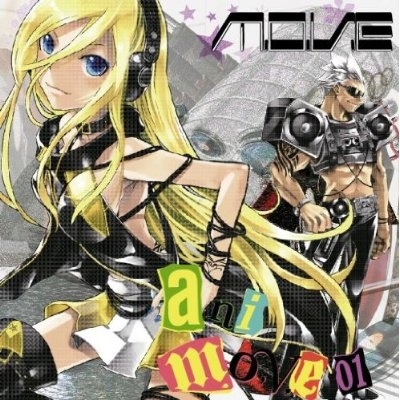 The character design that was sketched by KEI and shown in DTM appears on the cover of the CD “anim.o.v.e. 01,” which features such artists as m.o.v.e., Takarano Arika from Ali Project, and AKINO, covering various anime songs. The two on the cover are said to be the members of m.o.v.e. Cool The world always has room for more vocaloids. hmm… I have hope in her. ^_^ Lily looks like she could sing rock or pop… I like that! 😀 Let's see what happens! m.o.v.e is the one behind most songs in initial d soundtrack. so i think the first song that would gather views are songs like dogfight and noisy tride. wow! from initial D? i think this vocal would be cool then! Looks cool! Can't wait to hear how she sounds. i'm just glad she's not a crypton vocaloid. Another female Vocaloid? I'm not really excited about it. Something about this just screams "HOAX!" to me.. dunno. Maybe I'm just upset that we're not getting more guys, silly stupid me. OMG kewl! thats my name! That's not exactly a good thing…. How is being a Crypton Vocaloid not a good thing? They are all the most popular because they are good quality and really original. I believe she's saying it's not a good thing that just because it's a Crypton Vocaloid, it becomes instantly popular– which is a reasonable assessment to make based on your original comment. Not really. Crypton vocaloids all sound the same upon close examination. Rin and Len are a given (same voice actor) but look at Luka. Luka sounds extremely similar to Len without a similar voice actor. Kaito and Meiko are basically the exact same thing. That's why Kaiko sounds so close to Meiko. Append is nowhere near as smooth as the AHS or Internet Co. vocaloids, and she's newer. Solid sounds like Rin in normal pitches, and when lowered, can be strangely similar to Kiyoteru. Sweet, although softer, has the same accent as Yuki Kaai and the same breathy-ness that she has. Dark early/demo could sound like Miki. AHS 'loids are not perfect, either, though. Miki can sound like Rin in some pitches, and Gumi in others. Her vowels are off-key. But she's definitely original – you won't see another vocaloid with fluff! Gumi is based off of another character(although she has a very high quality voice), and is not completely original. The words "code name" tell me it's likely AH (like code name miki). She actually looks like a Grown up Rin. But yeah, another Vocaloid… probably from AHS. Although this kinda means that some other company will be releasing new Vocaloids while Crypton will be remaking them. She looks like Kagamine Luka to me. It seems that whoever's producing Lily wants it to looks like Crypton made it. Probably to confuse people into buying it. It certainly looks better than most of AHS's vocaloids already. Three as far as I know– Kaito, Len, and Gakupo. OMG! icant wait for her! C'mon peeps! Be happy there's a new vocaloid! So what if she's a girl? Yeah, I want a new male vocaloid too, but for god's sake, be thankful! I like her. xD; But yeah. They need more guys. There's only three, right? Kaito, Len, and Gakupo? Hey i just heard Lilly shes amazing! You people need to have more faith, i'm sure they relize the world wants another male Vocaloid but from what i have seen so far Lilly is quite popular now and shes only been out for a few months! GO Lilly GO! And please please please please please, make more male Vocaloids! Us Americans love your music Japan, i just bought the vocaloid softwere and i have to say im highly impressed at it its easy to use for beginners like me, but im sure you have to deal with alot more than just this. Japan us American listeners would love another male Vocaloid so please at least think about it? i love lily she has the same name as me and i luv her voice!! i dont care if she dosent have a number (a real vocaloid) shes perfect! !